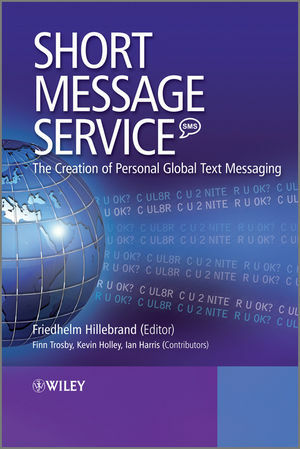 Written to celebrate the 25th anniversary of SMS standardization by the people who produced the standards, Short Message Service (SMS): The Creation of Personal Text Messaging, describes the development of the SMS standard and its ongoing evolution. The standardization of SMS started in February 1985 as a part of the creation of the second generation digital cellular system GSM, and the 25th anniversary of the first work on SMS provides an opportunity to review and understand how this service was developed. The book also looks to the future, as a large number of new GSM and evolved GSM phones will support SMS as a mass market high availability messaging service, a new simple Multimedia Messaging Service (MMS) suitable for use by everyone and for implementation in every new terminal is proposed. Fred founded Hillebrand & Partners in 2001and prior to that he held leading positions in ETSI. From 1996-2000 he was Chairman of ETSI SMG responsible for all GSM and UMTS standardisation work (200 Plenary delegates, 10 sub committees, more than 1000 participants). Before that he was a Technical Executive at GSM MoU Association responsible for GSM and UMTS evolution and development strategy and GSM promotion at global level. He is described as one of the "Fathers of GSM".